All transactions are safe and secure with a reliable history in online purchasing behind each of our associates. Buy The Walking Dead Terminus t-shirt to own Walking Dead clothing and merchandise. 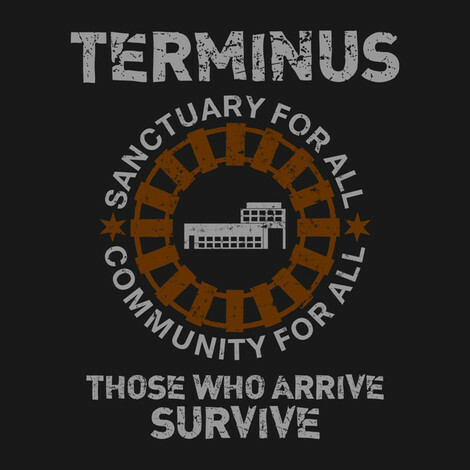 The design on this clothing item will let fellow survivors know that Terminus is a sanctuary for all and a community for all. Just follow the railroad tracks to the end. Be sure to tell everyone you know that those who arrive, survive. Wear it to watch Rick Grimes, Daryl Dixon, Carl, Glenn, Maggie and the rest their "family" take on the cannibals at Terminus. In addition to The Walking Dead Terminus tee above, browse the Walking Dead Clothing Gallery for more apparel like men's and women's clothes, kids shirts or hoodies.